Lakshaya Malhotra, is a corporate slave by the day and entertainer by the night. If you ask him where he hails from, you might get an evergreen reply, “Dilli se hun Bhenc**d,” only because it has a ring to it! 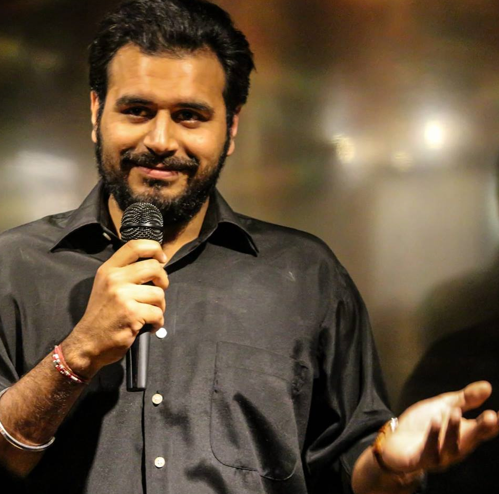 He has performed in quite a lot of open mics, and has opened for Jeeveshu Ahluwalia. Contrary to his name, he has no particular goal in mind and is going with the flow, laughing and striving to make people laugh. Humour Sapiens got into a Tête-à-Tête with Lakshaya Malhotra. Read on! How did you develop interest in stand-up comedy? I enjoyed watching comedy shows since childhood, and seeing those, I too wanted to make people laugh. Even during my school and college days, I used to be the go-to guy for laughs. A bunch of friends used to gather around me and I kept them entertained with jokes, and also roasting them at the same time. I had a certain level of comfort with them, so cracking jokes around them was easy. However, in reality, I suffered stage fright. My sisters played a major role in me taking the humour route, as interacting with them brought out the funny inside me. Any conversation we had was bound to take a funny twist. While growing up, I always pictured myself on stage and people listening to me attentively, whenever I said, “Mitronn”. And then one day, I went on stage, thinking that it would be the first and the last time I am being here on stage. I proved myself wrong the day I stepped on it for the second time. Your first step into the comedy world? It was during the school time, 8th standard to be precise, when I was asked to read the news during the morning assembly. Something took over me, and all I said was, “India defeated New Zealand by 28 runs. Now prayer by the person behind me.” Naturally, I ended up making fun of myself. The whole batch laughed and I became famous for such creative news reading. I sure was a little embarrassed later, but now, I can still pull such stunts with ease. Perks of being a budding stand-up comic, I guess. But in reality, I wanted people to listen to me and my perspective of things. Yes, stage fear was always there, I did go on the stage with shaky legs for the first time, but prepared to tell people my perspective of things, whether they judge me or not. I began attending live comedy shows to gain an idea on how to and what to do on stage. Then came the part where I got to perform at open mics and had amazing audiences to perform to. Which was mostly in single digit. Reality hit me hard! What pulled me into comedy quite literally was that one open mic where the audience showed up in double digits, some 30 odd people, for a change. This first open gig of mine went pretty good. And gave me a confidence boost. Since then, I have been performing regularly at open mics, hosting shows and loving it! What are the challenges that you have faced in the journey so far? There have been quite a number of challenges that I have faced, like ‘single-digit audience members’ or No audience during open mics at all. People not supporting live shows or budding artists feel pretty demoralising. But we comics are on it to change it. As an aspiring comic, I have faced the lack of opportunities, and this is the reason I decided to do something to attract the audience towards live comedy shows. So, I started a small production house named ‘THE BLACKBUCK COMEDY’. Under this name, I organize various comedy shows and comedy open mics at different venues across Bangalore. Everyone should get a fair chance to showcase the talent they possess. TBC is still growing as a production house, and I hope, it becomes well-recognised one day. I performed for an NGO and contributed to raising funds for the cancer patients. Opened the show for some big names like Jeeveshu Ahluwalia, who was an idol for me during my initial days of comedy, and still is. First of all, many people think that bombing is when you do good, just to clarify, bombing in terms of comedy means exactly the opposite of that. Coming back to the question of bombing ‘moment’, I would say there were ‘moments’ with an ‘S’. And there always will be. Any comedian who says that they haven’t bombed. Don’t trust, it’s a lie! Bombing is an inseparable part of a comedian’s journey. I have bombed in front of audience ranging from 300 people to 1 odd person. There have been many instances and there will be in future. It’s just that, the best part of performing at open mics is, your ego goes down to zero or rather, negative. So, you eventually become all cool about bombing. It’s a part and parcel of the comedy world. There’s a thing, I won’t stop because there are good shows too, where I don’t bomb but crack people up. Not every day is the same. Any experiences with annoying members? Not yet! And I hope this doesn’t happen in future. If at all it does, I will have another interesting story to tell at yet another show.